There was no heaven... no hell. I have been waiting for what feels like forever for the third and final Avenues Ink novel, and oh my God, has A.M. Johnson made sure the wait was worth it. 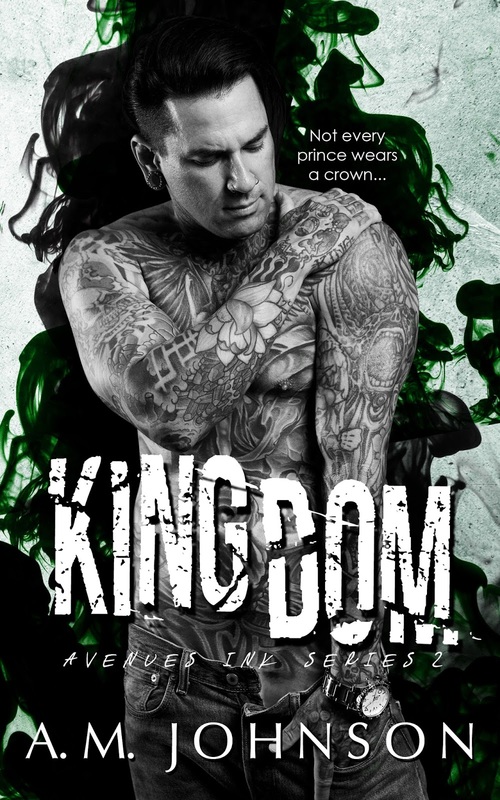 After meeting and falling for Declan and Liam in Possession and Kingdom, respectively, we now have the youngest O'Connell's story. Kieran is twenty-seven and the one with a poet's soul. He weaves words together and creates poetry with each line he jots down, putting pieces of his thoughts and feelings on paper. He was the one who was destined to become a priest...that is, until Fate has him changing course. Now, with his brothers by his side, he works at Avenues Ink, the tattoo studio owned by his eldest brother. Liam and Declan have gone and fallen in love, and Kieran wonders when his time will come. Then at Mass, he offers a Sign of Peace to the woman who makes his world stop. Soon, thirty-year-old Melissa Trujillo becomes Kieran's world, but Mel has secrets--things from her past that led her to do things that she's ashamed of. Her life now is in penance for her sins, but if she gives them a chance, will Mel ever find absolution in the arms of Kieran? We're two and a half months away from the new year, but I already had a feeling that the Avenues Ink series was going to end up on my list of the best reads for 2017, and Poet more than clinched a spot for the series as a whole. This is only the fourth novel of A.M. Johnson's that I've read, but she's impressed me each and every one of those four times I've read her work. With this latest release of hers, she's given all three of the O'Connell brothers the kind of happily-ever-after that they deserve. That doesn't mean, however, that everything is perfect going forward, as evidenced by the mini trials that Declan and Paige as well as Liam and Kelly still encounter, which is a reflection of how real life is. Nothing and no one is perfect, but as was the case in Liam's, Declan's, and Kieran's lives, both as a family and as individuals, you make the most of your circumstances and you get back up and make your own place in the world. Possession and Kingdom were very tough acts to follow. When I say my expectations were sky-high, I mean they were out of this world. But I'm thrilled to say that Poet more than met every single one of them. I so empathized with Mel in this story. She made many disastrous choices, but she also made a few courageous decisions. Addiction isn't merely about quitting whatever your vice may be; the hard part comes after you've decided to put a stop to the addiction. She was an inspiring main character, and it had a lot to do with the fact that she wasn't trying to be pious or act as if she had everything under control in her life. She still made mistakes. She still stumbled and fumbled, but what mattered was that she owned up to her mistakes and stood back up. She made amends. Sure, there were a couple of moments that had me frustrated with her actions, but I so got why she did what she did. She was, after all, a work in progress, and see, that's what I loved about this series as a whole. Each of the main characters was exactly that--a work in progress. There was nothing ideal about them or their circumstances, but they were human and they tried to be and do better. Mel could have let Kieran swoop in and rescue her but she knew that if there was any hope for them, she'd have to be stand steady and firmly beforehand.